Have you ever really taken a look at the names in the United State's Social Security Administration's Top 1000 most popular names chart? I mean, have you really looked at it? I decided to fish a little bit and I found a ton of Arabic names swimming right at me. Had I really never noticed these names before? Sure, I'm not an ethnic match for any of them but not all of them stand out as foreign. Just take a look at the female names! Many of them aren't obviously Arabic and they are no doubt being used on girls of a variety of races all across the country. For example, the highest ranking name is Layla at #29 and it has so many variants that are very fashionable today such as Lyla, Laila, Lila, Leila and Lilah which all rank within the Top 1000. Then there's the Aaliyah sisters with a similar story. 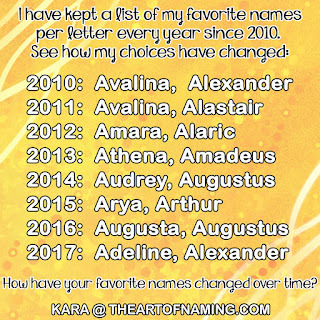 The feminine names are all so beautiful. They have a certain elegance about them that no doubt is the reason they are so appealing cross-culturally. What do you think of this list? Have I missed any? Share your favorites in the comments below!